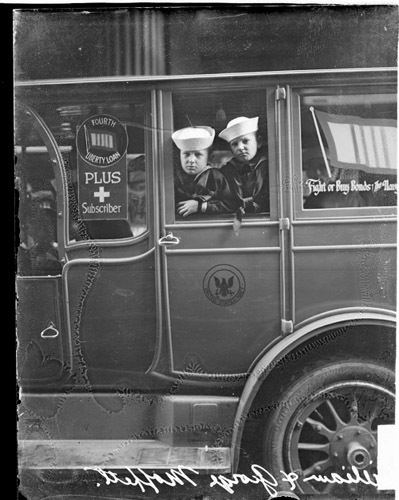 Title [William Adger Moffett's children, George and William, leaning out window of automobile advertising liberty bonds] [graphic]. Collection summary Portrait of the children of William Adger Moffett, George and William, leaning out of the window of an automobile with a seal on the door. Signs in the windows of the automobile read: Fourth Liberty Loan Plus Subscriber and Fight or Buy Bonds. This image was taken in Chicago, Illinois.